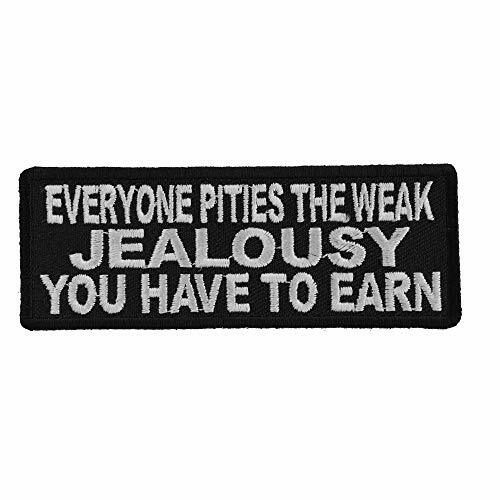 Everyone Pities The Weak Jealousy You Have To Earn Patch measures 4x1.5 inch. MANUFACTURED By Ivamis Trading. This is an iron on patch with Plastic iron on backing. To Iron on the patch set your iron to yield a temperature between 260-280 degrees Fahrenheit. If you are using a heat press 12 seconds is sufficient. If you are using a household iron 30 seconds of applied pressure will be enough. We recommend a frying pan thermometer to get your iron to the correct temperature. Set your iron on top of your clothing without the patch with the thermometer probe sandwiched between iron and your clothing. This patch has embroidered and laser cut borders, it can be sewn on to clothing. You can sew the patches on to any material. We recommend sewing patches on to leather. Do not iron on patches to leather as this will scorch your leather and ruin it. Do not remove the plastic iron on backing when sewing on the patch. You'll damage the patch if you do. The iron on backing has two uses. It allows you to iron on the patch AND it also holds the embroidery together for a durable more sturdy patch. This is a top quality embroidered patch for Clothing. We use 100% Rayon Synthetic thread for maximum durability and color preservation. The patch is made out of all new materials. We use twill or velvet as our background material. The plastic iron on glue is a Japanese brand glue and will work the first time you attempt to iron them on as long as you use the correct temperature setting and apply a good amount of pressure. Put your weight on the iron if using a household iron. Set your iron to highest setting. Wait till the temperature reaches 280 degrees Fahrenheit then unplug your iron. The temperature will continue to rise a little more. Once it starts to drop and reaches 280 degrees move your iron, do not lift iron as this will dissipate heat too quickly. Place your patch and put iron over the patch and press hard for 30 seconds. This will best ensure that you are at the correct temperature which is essential for proper adhering. Do not iron on patches to leather.